Most people look forward to retirement and plan on Social Security to cover at least some of their retirement expenses. Before joining the nearly three-quarters of Americans that opt for early benefits at age 62, consider that many Americans are better off delaying benefits to maximize their income during retirement and the amount they leave to heirs. 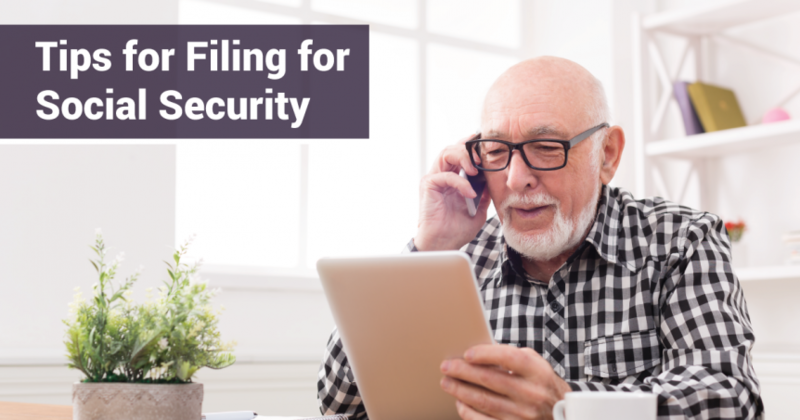 In this article, we will take a look at how to decide when to file for Social Security and how to apply for benefits. The Social Security benefit formula adjusts monthly payments so that someone living to an average life expectancy will receive about the same amount of benefits over their lifetime regardless of when they file for benefits. But that doesn’t mean that it doesn’t matter when you take benefits—the decision can make a big impact on your wealth and lifestyle. Most people are eligible to begin receiving Social Security benefits at age 62, but there are incentives for delaying the benefit to full retirement age (FRA) or later. These benefits max out at age 70. At that point, everyone must take Social Security benefits to avoid leaving money on the table, but when is the optimal time from a financial standpoint? Interest rates are less than 3.5%. Interest rates are greater than 3.5%. You’re a single woman. You’re a single man. You’re in a two-earner couple. You’re in a one-earner couple. You’re considering deferring the primary earner benefits. You’re considering deferring the secondary earner benefits. Of course, these are recommendations based on averages taken from actuarial data. The right decision for you depends on a few other factors. One of the biggest factors is your life expectancy. According to the Social Security Administration, the average 65-year-old today will live to age 85, one in four will live past age 90, and one in ten will live past 95. Women and married couples also tend to have higher than average life expectancies. You should conduct a breakeven analysis and compare your estimated life expectancy with the different breakeven points. The Standard’s breakeven calculator can help you make these decisions. 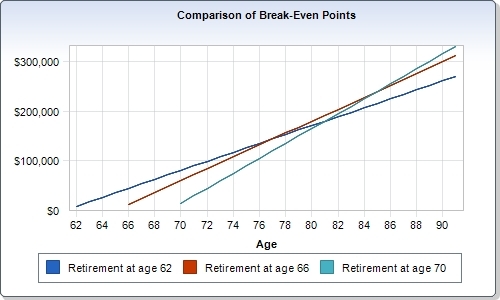 For example, the chart below shows the breakeven points assuming $1,000 at full retirement age, $750 for early retirement, and $1,250 for delayed retirement. If you’re married, you should also try to maximize combined Social Security benefits over both of your lifetimes, as well as survivor benefits. For example, you may use the 62/70 split strategy where the lower-earning spouse takes early Social Security and the higher-earning spouse maximizes their benefit. You may also be eligible for benefits from your ex-spouse if you were married for at least ten years and are currently unmarried. Delaying benefits guarantees an eight percent increase in Social Security income each year. It may be hard to find this level of return at such a low risk. Delaying also gives you flexibility. You may set a goal to start benefits at age 70 when they reach their maximum. However, if your portfolio isn’t performing well or you need additional income, you can start receiving benefits. If you start receiving benefits at age 62 and need more income, you will be faced with some difficult decisions like going back to work or cutting expenses. Finally, don’t forget your other sources of retirement income. Lower interest rates translate to lower returns for fixed-income investments, which means it might make sense to sell them and delay taking Social Security benefits in low-interest rate environments. On the other hand, if you don’t have any other retirement savings, or very little in savings, you may not be able to afford to delay Social Security benefits. The Snider Method provides a great way to generate predictable retirement income—even in low-interest rate environments. In some cases, this income could enable you to delay taking Social Security benefits and maximize your income. For more information, sign up for our free introductory courses. It’s important to note that the best financial decision isn’t always the best personal decision. For example, you may have sufficient retirement savings to support your retirement and want to prioritize income during early retirement years rather than solely trying to maximize your income. Or, you may be willing to sacrifice monthly income in exchange for the ability to retire at an earlier age than would be otherwise possible. In many cases, a typical American isn’t interested in squeezing every last dollar out of the Social Security system, but rather, maximizing happiness during their retirement years. You shouldn’t be impulsive in making poor financial decisions, but there are some trade-offs to consider in the process. Financial advisors can help you explore both the financial and personal aspects of deciding when to take Social Security and help you come up with a plan that’s right for you. How Do You File for Social Security? 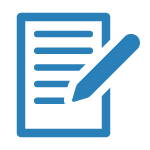 Deciding when to take Social Security may be difficult, but applying for benefits is surprisingly straightforward. You must be at least 61 years and 9 months old and want your benefits to start no more than four months into the future. In other words, you can’t apply too far in advance. If you’re almost 65, the same application will include Medicare benefits. 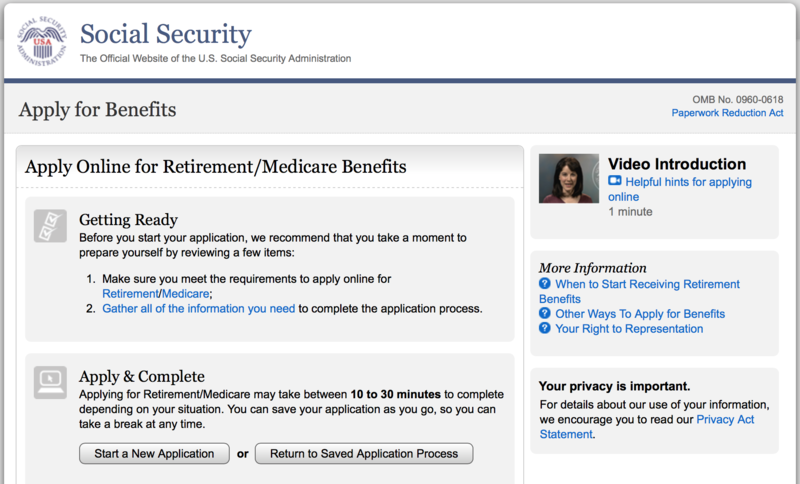 When you’re ready, the easiest way is to apply online using the Social Security Administration’s Online Application. This process takes between 10 and 30 minutes to complete depending on your situation. If you don’t have time to complete the application in one sitting, you can save the application and login to complete it at a future date. If you accidentally applied for Social Security or change your mind, you may file a Request for Withdrawal of Application to halt the process. If you have already started receiving benefits, you can even opt to repay those benefits and reset your Social Security benefits timeline if the decision is made within 12 months from the application date. The process of deciding when to apply for Social Security benefits and pulling the trigger can be stressful and intimidating. While it’s tempting to opt-in as soon as possible, it’s important to sit down with a financial advisor and consider your options to make a rational decision. Here are the 6 times during retirement when you can receive Social Security benefits. Subscribe to download this free resource.